Disaster Plan vs. Continuity Plan : Consolidated Technologies, Inc. The adage, “Hope for the best, and plan for the worst” is a smart strategy when it comes to business. Even when your business is thriving, it could all come to a sudden halt if you experience a disaster you’re not prepared to overcome. Whether it’s a flood, fire, power outage, hardware crash or any other emergency, you need to be prepared for this worst-case scenario, so if it ever happens, it doesn’t ruin your business. In this post, we’ll look at two different terms associated with planning for incidents that could negatively affect your business operations: disaster recovery planning and business continuity planning. Though these terms are closely related, they are not interchangeable, so it’s helpful to understand the difference. Together, a thorough disaster plan and overall business continuity plan can help your business meet disasters head-on so you can continue to thrive. Especially in today’s business world, where supply chains and networks are often complex, an issue at any given point in the chain can create a ripple effect of significant problems. While events like weather disasters can have an impact on all businesses, each business has its own unique potential problems that could threaten its productivity. A business continuity plan (BCP) is a strategy for how your business will handle these problems. As the word continuity suggests, a BCP is focused on maintaining your business operations rather than allowing a natural or human-caused disaster to bring them to a screeching halt. Some threats to your business could cause a mere hiccup in productivity, while others could spell disaster for your business. A business continuity plan considers all possible scenarios, so you can be prepared to proactively respond to each one. There are some important advantages to having a BCP. The most obvious is that you can save money by avoiding costly, unplanned downtime. Another benefit is that employees will know what to do in the event of a system going down. Compare this to the stress and confusion that employees may feel if they are without direction and are scrambling to figure out how to move forward. Employees aren’t the only ones who are affected when a system goes down. Customers can become frustrated if you’re unable to deliver promised goods or services. A BCP can help you retain your customers and keep them happy. What Are the Steps in Creating a Business Continuity Plan? The first step is to conduct a business impact analysis (BIA). This step involves identifying how a disaster could impact your business so you can use this information to develop recovery strategies. For example, you’ll probably identify several financial impacts like missed sales, expensive downtime and more. You may also identify consequences like upsetting or even losing customers, and you will want to define recovery time objectives as well. In other words, determine how quickly you need to get things working again to stabilize business operations. Once you’ve created a report from the business impact analysis, you can begin to develop some strategies. You want to see where there are gaps between your current capabilities and your actual need for mitigating the negative impacts identified in the BIA. Since you’re not into the actual planning stage yet, think of this step as a more broad-strokes strategizing phase. This is the step where the real concrete planning happens. You’ll want to assemble and work with a team to identify the step-by-step plan for how your business will respond in the event of a problem that threatens to wreak havoc on your productivity and profitability. It’s critical to have approval from management and that you carefully document all parts of your plan. That way, it’s in writing, and employees can refer to it whenever necessary. Once your plan is in place, you need to train the business continuity team and then move forward with testing the effectiveness of your plan. Simulate a disaster and see how your plan works when it’s carried out in real life. Try a variety of exercises so you can gain as much input as possible. Then, use what you learned from testing to refine and update your BCP. What Is the Difference Between a Disaster Recovery Plan and Business Continuity Plan? Now that we’ve discussed what a business continuity plan is, let’s look at what a disaster recovery plan (DRP) is to understand the difference between these two related terms. First of all, it’s helpful to understand that a business continuity plan is a larger umbrella that a disaster recovery plan falls under. So, what is a disaster recovery plan? While a business continuity plan is an overall strategy for how your business will continue to operate in spite of a disaster, a DRP is aimed specifically at restoring critical support systems related to information technology (IT) in a timely manner. Anything from a minor hardware failure to a significant security breach can create an IT disaster. Consider all the ways your business uses IT and how these operations could be disrupted. If your hardware breaks, if your software experiences an issue, if you lose connectivity, if data is lost or if it becomes vulnerable, how will you handle such a scenario? How will you repair or replace the damaged hardware? How will you regain connectivity, and how will you recover or secure data? The answers to these questions are what comprise your disaster recovery plan. When you write out your business continuity plan, the DR plan should be a subset of the overall BCP. For businesses that depend on information technology for nearly every aspect of their day-to-day operations, the disaster recovery section may be the most important part of their business continuity plan. Why Is Disaster Recovery Important for Businesses? In today’s business world, even small businesses rely heavily on technology. If you don’t take the time to create a disaster recovery plan, you may not realize how critical IT is to your business operations until you lose it. Consider, for example, that your data is lost or corrupted somehow. This can happen due to hacking or malware, a hardware failure or simply human error. Data breaches have been increasing in recent years, and small businesses are often targeted. Most businesses store and need access to a significant volume of data to keep operations running. So, what do you do if you suddenly lose access to sales records, inventory data or other critical types of documentation? Did you know that, following a disaster, 90 percent of companies that aren’t able to resume operations within five days fail completely within a year? A statistic like this should serve as a wake-up call for all businesses that don’t have any sort of business continuity or disaster recovery plan in place. A disaster recovery plan is not a luxury or an extra — it’s a necessity. When any part of your IT system goes down, you can’t afford to be without a DR plan. Remember that a successful DRP won’t necessarily keep things running completely smoothly, but it should minimize the impact of an emergency disruption as much as possible. The quicker you can get things back to normal, the better. Customers may be understanding enough to wait a little longer on expected goods or services, but when an IT disaster continues to cause problems for days or weeks, your customers are likely to give up on your business and view your services as unreliable. If the disaster you’re experiencing is due to a weather or natural event that is affecting many business and people in your area, then your customers or clients may be more understanding. However, this doesn’t change the fact that you may be hemorrhaging cash for the duration that you’re working on trying to restore operations. Also, consider the way your business could stand out if your competitors are floundering after an event like a hurricane or flood. This is where the business with the DRP will shine and be able to serve the community even when other businesses are out for the count. 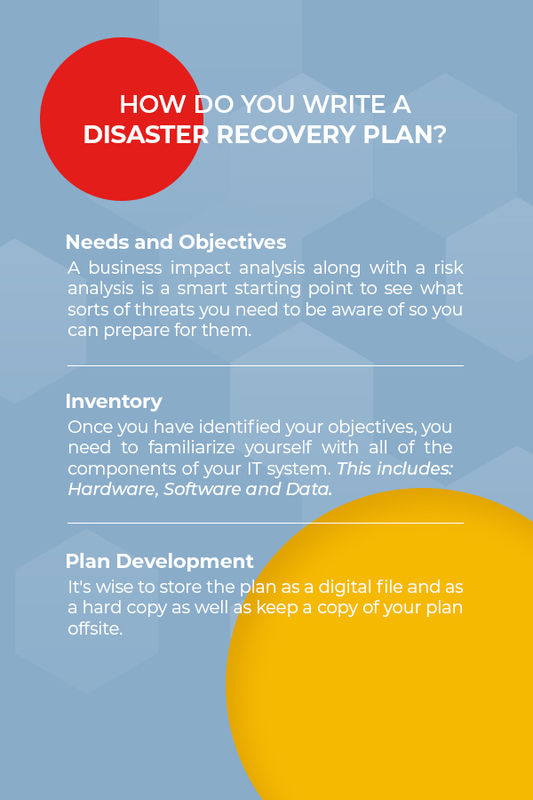 How Do You Write a Disaster Recovery Plan? As with your overall business continuity plan, writing a disaster recovery plan involves a few steps, some of which will coincide with the steps you take to create your BCP. The first step is to define your business’s needs and objectives, so you can create a disaster recovery plan that is tailor-made to your business. A business impact analysis along with a risk analysis is a smart starting point to see what sorts of threats you need to be aware of so you can prepare for them. You also need to determine how quickly you must restore your information systems to maintain productivity. For example, how long can you afford to be offline? How long can you get by without access to your sales data? Based on this assessment, you’ll define a recovery time objective. You’ll also want to ask yourself which files you really need to access to maintain operations. A recovery point objective defines how far into the past you need data from. 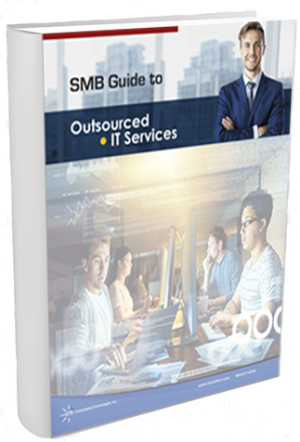 Your business may only need to focus on recovering data from the last few hours or few days, or you may need access to a larger volume of backlogs. Hardware: Hardware can include laptop computers, desktop computers, servers and more. These are the tangible pieces of your technology. Software: Software may be installed on your local hard drive or it may operate through a cloud-based system. Data: Data can also be stored on your hard drive or in the cloud. It can easily pile up over the years to the point where you have no idea what data you’re storing. Catalog it all, so you’ll recognize if any goes missing. For each of the categories above, determine how you could quickly replace or restore them in the event of a disaster. Generally, you’ll want to place a higher priority on quickly getting hardware and software back up and running. Data may be useless if you don’t have the hardware or software you need to access and use it. When all the information is in, you can formally write up your plan. Try to be as specific as possible. Don’t think of writing your disaster recovery plan as simply getting it over with and checking a box. Instead, adopt the mindset that you will have to refer to this plan one day, and when that time comes, you want it to be clear, practical and helpful. Of course, you can hope that you’ll never need it, but technology has been known to fail, so it’s not pessimistic to think in these terms. It’s wise to store the plan as a digital file and as a hard copy as well as keep a copy of your plan offsite. This way, even if all your files are inaccessible or if all the paper files in your office are destroyed, you can still access your plan and quickly begin to put it into motion. How Often Should a Disaster Recovery Plan Be Updated? Consider the difference in how your business uses information technology now versus one year ago. Chances are, the way you use IT has evolved. Based on this natural fluctuation, you should revisit and possibly update your DRP at least once a year. You may find that an annual update isn’t enough, though. You should reassess your DR plan as often as you need to keep it current. Your hardware or software has been updated. Your staffing structure has changed. You’re in a new facility. Your recovery time objective or recovery point objective has changed. So, the answer to the question really depends on your business. Just make sure you prioritize updating your disaster recovery plan whenever necessary to ensure it’s as current as possible if you ever need it. Learn More From Consolidated Technologies, Inc. Here at Consolidated Technologies, Inc., we understand how technology can be both an amazing tool and a potential problem for businesses. We work with businesses to develop effective solutions for a business’s software and technology needs. Our staff has the expert knowledge and access to cutting-edge technology needed to provide powerful results. Over 2,000 companies have reaped the benefits of assistance from Consolidated Technologies, Inc. to harness technology in a way that enhances your business’s functionality. Contact us online or call us at (888) 477-4284 to learn more about how we can help your business.